A peroxide is a chemical substance that contains a peroxo unit, one that has a chemical formula of O22-. The most familiar example of a peroxide is hydrogen peroxide, shown here on the right with the peroxo unit in red. In lab slang the term "peroxide" is sometimes used for hydrogen peroxide. Hydroperoxides contain the O-O-H- unit. Hydrogen peroxide is therefore also an example of a hydroperoxide. One of the most commonly used hydroperoxides is called t-butyl hydroperoxide (or tert-butyl hydroperoxide), shown on the right. Peroxides and hydroperoxides are highly reactive materials and may be extremely shock-sensitive explosives. Peroxides can form readily in certain organic materials, especially ethers. Simply moving or just screwing the cap off a bottle that is contaminated with peroxides can lead to an explosion, injury and/or death. Read all of the following information carefully! Thanks to David E. Blair of Heritage ETS for the pictures. You can find more pictures here. Peroxides can occur in virtually any kind of organic chemical, however, certain chemicals are particularly prone to peroxide formation and pose special hazards. Here is a list of some of the most common peroxide-forming chemicals (see J. Chem. Ed 1970, 47(3), A176; subscription required to view on-line). This list is not comprehensive. Other materials that are chemically similar (alkenes, ethers, allylic and propargylic species) generally have similar risks. Note: Some inorganic peroxides are generally OK to handle, but pose serious incompatibility issues when used with organic chemicals. 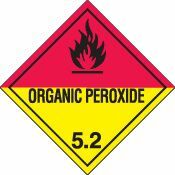 If you use any peroxide that is sold in pure form, read the MSDS very carefully before use. Get your laboratory glassware and accessories from Safety Emporium. When you receive a bottle of the material, write "Received on:" and the date on the label. Be sure to enter the bottle into your chemical inventory records at that time. Do this for ALL chemicals, not just peroxide-forming ones. When you open the bottle for the first time, write "Opened:" and the date on the label. It helps to enter this in your chemical inventory record as well. Do this for ALL chemicals, not just peroxide-forming ones. Pick a good database program to maintain your chemical inventory list. Ideally, you'd like to have a special field or checkbox for peroxide-forming materials. Do not purchase more of the chemical than you can reasonably use in three month's time. Peroxides can build up over time as solvent evaporates and/or air seeps into the bottle. Make sure you purchase material that contains an appropriate peroxide inhibitor such as BHT. If you must store non-inhibited material, be sure to store the material under an inert atmosphere of nitrogen or argon and test it for peroxides at least once a month. Do not distill, evaporate or concentrate the material until you have first tested the material for the presence of peroxides. Peroxides are usually less volatile than their parent material and tend to concentrate in the (hot) distillation pot! Establish a laboratory routine to test all of your peroxide-forming chemicals on the first day of each month (or no later than every 3 months). Do not store peroxide-forming materials in clear glass bottles (light can accelerate the chemical reactions that form peroxides). Always use an amber, but transparent bottle. Do not store the material in a metal can or other container that prevents you from examining the contents without having to open or touch the container. Do not store peroxide-forming chemicals near heat, sunlight or ignition sources. Avoid places that undergo temperature variations which can cause the bottle to "breathe in" oxygen. Do not purchase or use high-risk items such as diisopropyl ether. Use a different solvent instead. NEVER UNDER ANY CIRCUMSTANCES touch or attempt to open container of a peroxide-forming liquid if there are whitish crystals around the cap and/or in the bottle. 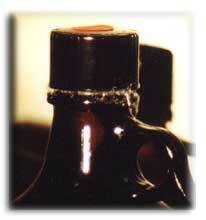 The friction of screwing the cap could detonate the bottle with disastrous results. To see what these crystals can look like in a severe case visit this page at Reactive Hazards Reduction Inc. and be sure to read about the resulting detonations! For another amazing peroxide story see Deactivating a Chemical Bomb, a story about an unstabilized cylinder of 1,3-butadiene. If you encounter such a bottle, contact your Environmental Health and Safety office. If your organization does not have someone equipped to deal with or assess this hazard, call your local police department bomb squad (no kidding). DO NOT TOUCH OR MOVE THE SUSPECT BOTTLE YOURSELF FOR ANY REASON. Peroxide crystals have formed above the level of the liquid. It is imperative that peroxide-forming chemicals be stored in optically clear non-metallic containers so you can see if any precipitates have formed. Even then, it can be difficult to see crystals. NEVER shake a container that potentially contains peroxide crystals as this could cause them to detonate. Peroxide crystals are present in the liquid. Some materials form completely or sparingly insoluble peroxides. This is particularly true for polyperoxides, which are insoluble polymers. See the links to the DOE Office of Health Safety and Security under Further Reading for several examples of where false low readings have lead to explosions. There are a variety of methods suitable for the detection of peroxides. Methods C and D are the most commonly used for ethers. Method A is a best bet for anyone who has little laboratory experience. In all cases run a blank sample (one you know doesn't form peroxides such as n-hexane) so you know what a negative result looks like. If possible, also run a blank sample that you have spiked with some hydrogen peroxide so you know what a positive result looks like. Commercially available test strips. You can purchase these from most safety or laboratory supply houses. Some examples include Baxter Scientific, Fisher Scientific, and VWR Scientific. To use most of these, simply dunk the strip in the suspect material and then compare the color on the strip to the calibration chart that comes with the test kit. This gives a quantitative peroxide concentration, usually in ppm (parts per million). Caution: these strips have finite ranges. You may need to buy several different test kits to cover all possible ranges; read the product information or call the manufacturer for more info. XPell Indicating Pellets - Xplosafe recently unveiled XPell, a product that both detects and destroys peroxides in a variety of solvents. The pellets are a high-surface area inert silica substrate coated with a nanoparticulate blue coating that changes to green to yellow to pale as the protection is exhausted. One tablespoon treats a typical liter of solvent. The company also makes indicating test strips based on the same technology. Postassium iodide indicator. Prepare a fresh solution of 10% (by weight) potassium iodide, KI, in distilled water (for some chemicals, acetic acid is a better choice). Add 1 mL of this clear, colorless solution to approximately 10 mL of the test material in a clear vial or test tube, shake well and wait about 30 seconds for color changes to occur. Peroxides will oxidize the colorless iodide anion, I-, to elemental iodine, I2, which gives purple or brownish solutions depending on the solvent. Purple, brown or purple-brownish colors indicate relatively high concentrations of peroxides and yellowish colors indicate low concentrations. Starch-iodide indicator. This procedure is identical to the KI test shown above, but shows color changes more easily because any iodine that is generated combines with added starch to form an intensely deep blue solution. Perform the test as indicated above, but add 1 drop of a saturated solution of starch in water. A strong blue color indicates peroxides. You can prepare your own starch-iodide test strips by dunking strips of filter paper into your starch iodide paper and allowing them to dry. Store these away from light in a dry place. Be sure to test these against a dilute hydrogen peroxide, H2O2, solution so you know they work correctly. Sodium Dichromate indicator. Add no more than 1 milligram of sodium dichromate, Na2Cr2O7, and 1 drop of dilute sulfuric acid, H2SO4, to 1 mL of water. Add approximately 10 mL of your ether to your dilute dichromate solution and shake well. The presence of peroxides is indicated by a blue color in the ether layer. 1% (by weight) ferrous ammonium sulfate [also known as ammonium ferrous sulfate or ammonium iron(II) sulfate], (NH4)2Fe(SO4)2, in water. 1 N (essentially 1 molar) sulfuric acid, H2SO4, in water. Caution: always add acid to water, not vice-versa. 0.1 molar ammonium thiocyanate, NH4SCN, in water. To make 1 liter of such a solution, add 7.16 grams of ammonium thiocyanate to a 1 liter volumetric flask and fill to the mark with distilled water. If necessary, decolorize the solution by adding a trace of zinc metal dust. Combine 5 mL of your ferrous ammonium sulfate solution, 0.5 mL of your dilute sulfuric acid and 0.5 mL of your ammonium thiocyanate solution. Shake with 6 mL of the suspected material. A red color indicates the presence of peroxides. Chemists will have to deal with peroxides at some point in their careers. For low levels of peroxides, there are steps you can take to remove or eliminate these contaminants, but you should only do so after verifying the peroxide levels. If you see visible white crystals in the container or around the cap then STOP. This is a bomb squad job. Caution: use the following accepted procedures at your own risk. If you have no experience in dealing with such situations do NOT try any of these corrective procedures. NEVER ATTEMPT TO DEAL WITH WHITE PEROXIDE CRYSTAL DEPOSITS YOURSELF. Call your local police bomb squad (if you do not have one, your state or provincial police will surely have one) to deal with the container. There are different methods available. Which one you pick depends on knowing the chemical properties of the material and any possible incompatibilities with the materials used to treat the peroxides. Either of the first two methods would be a good choice for diethyl ether, for example. Add 6 g of ferrous sulfate, FeSO4, and 6 mL of concentrated sulfuric acid, H2SO4, to 110 mL of water. Shake or mix well. Caution: always add acid to water, not vice-versa. Shake approximately 1 liter of the peroxide-contaminated material in a bottle or separatory funnel with 5-10 mL of your ferrous sulfate solution. Remove and discard the aqueous layer. Wash/shake your solution with distilled water and discard the aqueous layer. Repeat your peroxide test on your material. Repeat step 2 as necessary until the test is negative for peroxides. Pass your contaminated material through a standard chromatography column packed with activated alumina (Al2O3). Allow approximately 80 g of alumina per 700 mL of material. Test the purified material. Repeat step 1 as necessary until you get a negative peroxide test. Caution: the peroxides will remain on the alumina in active form. Wash your alumina with the FeSO4 solution described in method A above before disposing or reusing your alumina. Do not combine it with other wastes if you (foolishly) decide not to treat the alumina before disposal. This method (which we will not detail here) is a common drying and purification method for certain organic materials. This will destroy peroxides, however, given the potential danger of accidentally concentrating or detonating the peroxides it is strongly recommended that you first eliminate them using method A or B before distilling the material from sodium/benzophenone. Note that destruction of high level of peroxides is a procedure fraught with peril and risk of bodily injury, including death. See the links to the DOE Office of Health Safety and Security under Further Reading for several examples where attempted treatment of peroxides led to unexpected outcomes. Get your fire safety signs, posters, equipment and training materials at Safety Emporium. Peroxide formation in organic materials is usually initiated by a free radical, a molecule with an unpaired electron. Free radicals are hard to avoid as they are continually formed by exposure to light or heat. For this reason, chemicals that are likely to form peroxides often contain an inhibitor that will consume free radicals as they are formed. A common inhibitor is BHT (butylated hydroxytoluene, also used as a food preservative). In the example below we'll use R. to represent a generic alkyl radical (the dot represents the unpaired electron). In the case of diisopropyl ether, the free radical abstracts a hydrogen atom from a carbon next to the ether oxygen atom. This forms an RH molecule (called an alkane) and gives the ether molecule an unpaired electron. The ether is now the radical! The ether radical can react with atmospheric oxygen (O2) to form an alkylperoxy radical, which in turn can react with a second molecule of ether to form a hydroperoxide and generate an ether radical identical to the one we started with. This new radical can also react with oxygen to form additional hydroperoxide and generate an identical radical. This process can go on virtually forever, so this is sometimes called a catalytic chain reaction or autooxidation. Likewise, at slightly elevated temperatures (ballpark: 70 degrees C), the hydroperoxide molecule can decompose to form two new radicals, both of which can go on to catalyze the formation of additional hydroperoxide, and generate even more heat. The hotter things get, the faster the decomposition and the rate of radical formation from hydroperoxide. This can obviously self-accelerate and lead to an explosion. Such situations are called autocatalytic reactions. Read your MSDS and be on the lookout for peroxide-formers. Read this ENTIRE document (OK, you can skip the chemistry of formation if you wish). DO NOT let your guard down when working with chemicals that can form peroxides. These can pose an incredible health and safety danger, but such danger can be easily avoided with a regular monitoring program and awareness of the potential hazards. R.J. Kelly's "Review of Safety Guidelines For Peroxidizable Organic Chemicals" was published in Chemical Health & Safety , 1996, Sep/Oct, 28-36. You can request a copy through the American Chemical Society's DCHAS web site. R.J. Kelly is also the author of Storing and Using Peroxidizable Organic Chemicals, written for Lawrence Livermore National Laboratory's Hazard Control Department (1999). Management of Time Sensitive Chemicals (I): Misconceptions Leading to Incidents, Sep/Oct 2004. Management of Time -Sensitive Chemicals (II): Their Identification, Chemistry and Management, Nov/Dec 2004. Management of Time Sensitive Chemicals (III): Stabilization and Treatment, Jan 2006 (contains all 3 parts as an MS Word document). Peroxides and Peroxide Forming Compounds by Donald E. Clark of Texas A&M is 16 pages of useful info. See the Hazardous Levels section on page 11 in particular. Michigan State University (179 Kb PDF file) has a larger list of peroxide-formers, notes on inhibition and recommended storage intervals. Information On Peroxide-Forming Compounds at Stanford University. The Canadian Centre for Occupational Health & Safety has a web page titled How Do I Work Safely With Organic Peroxides? Mason, D. Those Pesky Peroxides..., 2014, May/June. Clark, D. E. Peroxides and peroxide forming compounds 2001, Sep/Oct. See also: decomposition, ether, explosive. Get your DOT labels and placards at Safety Emporium. Entry last updated: Tuesday, August 16, 2016. This page is copyright 2000-2019 by ILPI. Unauthorized duplication or posting on other web sites is expressly prohibited. Send suggestions, comments, and new entry desires (include the URL if applicable) to us by email.